We always try to keep a frozen spheroid of Whole Foods' whole wheat pizza dough in the freezer. When we're feeling hungry and creative, we've been known to break out the pizza stone and try a new topping or two. And recently, we've come to the realization that this pizza dough, which, unlike our attempts at homemade dough rises on command, can be used to make other kinds of bread. In particular, we thought we might make cinnamon rolls. Cinnamon rolls are a wonderful, delicious treat, but not half as inspired as our next idea. Why not make cinnamon rolls, but stuffed with something else, say...pesto? They'd still be soft, moist, and delicious, but savory instead of sweet. And the fresh pesto's bright green color would add a nice touch to the presentation. 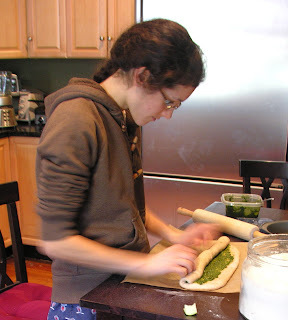 Luckily, we had already prepared pesto in the new food processor the day before, so all we needed to do was to unfreeze the dough and find a piece of unwaxed floss (more on this below). 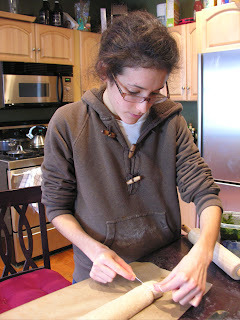 I've always been hesitant to try to make any of the family of rolled-up dough products after the unfortunate incident of the yule-log cake in Christmas '98 (it looked like the yule log had been the victim of Hurricane Andy). But I was confident that, as long as I didn't get in Mia's way too much, this would work. We arranged the pinwheels in a cake pan, let them rest in the warm oven for 45 minutes, and then baked them for about 30 minutes at 375 degrees F.
The result was better than we had ever dared hope. The pinwheels are just sticky enough to holds themselves together, while not be too sticky to separate from each other. Once you have one in your hand, you can unroll it or take bites from it as you please. The olive oil contributes a delightful moisture, and the combination of fresh pesto and bread smells is almost overwhelmingly pleasing. 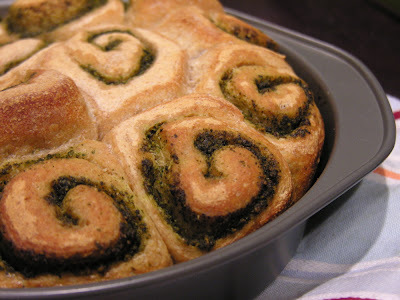 Next up - a Christmas combination of pesto and roasted red pepper pinwheels! Hello! Have you experienced the anticipated rise in readership yet? Anyway, this looks very fun and appetizing, congratulations. However, you should never admit in public that you make pesto in a food processor. Etymology, tradition and snobbery unanimously require mortar and pestle. More important if less topical, you have to fry eggplants. Lest you should mistake this for a suggestion, it is a fact. sleek new look, guys! annnd these look awesome. PS. the walnuts are delicious; they've been getting me through this snow-bound day of finals prep. Beautiful pinwheels -- would be fun to bring to a holiday potluck.